As a kid I experimented with Tarot cards. I think many of us did. That sort of rampant curiosity that comes with being a teen. The occult didn’t escape my attention. The mysterious Tarot cards, so iconic as a tool of prophecy, drew me in. Years later, this dabbling turned into downright research for my first published novel—Tarot: The Magician. I didn’t just want a story about evil Tarot cards. That felt too simplistic. Something the Syfy channel would whip up as their movie of the week. Instead, I delved into the history of the cards and how they started as the Dance of Death (see my article on it here). 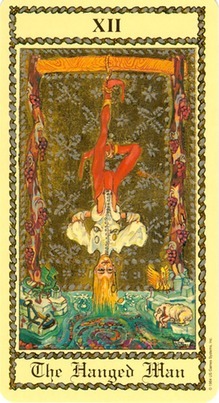 Three of the Major Arcana cards particularly influenced me: The Magician, Death, and the Hanged Man. These not only became themes for the novel, but characters as well. The title of the novel revolves around a man named Luke Rykell (you can read some of his history here). He helped create the cursed deck. His reward: being trapped inside. But he was no magician. The history of the card dates back to more of a con-artist or street hustler. One name for the original Magician card is Thimblerigger. Those were the sorts of fellas who tricked people with the three card monty. Their sleight of hand seemed like magic, thus the name of magician. Here the “Magician” is shown with his most famous trick: the cups and ball. For most of the history of the tarot, the Magician was simply a street performer and con man. In fact the card’s name was the Juggler or the Trickster. This all changed when the occultist Éliphas Lévi redesigned this card. He depicted the Magician holding one of the card suits (usually a wand) with the others lying on the table (these items replaced the cups and ball trick). Later, Paul Christian (a devotee of Lévi) renamed The Juggler as The Magus, and the change was complete. How does this relate to love? For most, the Magician represents skill, creativity, and free will. Yet when this card pops up with a romance question, the meaning shifts. It indicates that the time for a new romance is at hand. The moment is now. 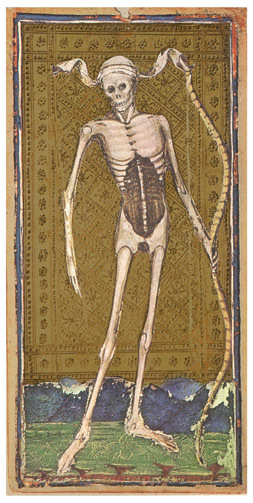 Most folks are frightened when the Death card appears in a Tarot reading. They shouldn’t be. The Death card represents change—clearing out the old to make way for the new. Think about a forest fire. As destructive as this process is, it burns away brush that is clogging out new growth. Only with this destruction can the forest revitalize itself. Even after the Black Plague that scoured Europe, the survivors were stronger for it. New evidence suggests that the disease targeted weaker and more frail people, leaving a stronger populace in its wake. 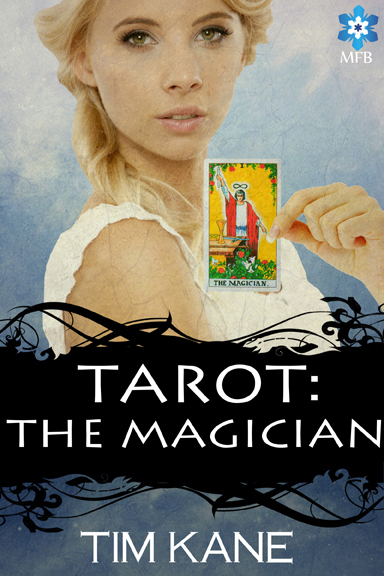 In the story of Tarot: The Magician, there is a death in our heroine’s past. Right now, this loss weighs on her, and prevents her from moving on with her life. She needs to deal with it, and clear it away in order to grow. The man hanging my one foot represents a traitor (the original Italian name was Il Traditore, the Traitor). May believe this represent Judas Iscariot, and the fifteenth century Rosenwald deck shows the figure clutching a small bag in each hand. This might be the thirty pieces of silver. Another argument suggests that this figure is Muzio Attendolo, who had been given a high position by the the Pope and then chose to speak out against him. The offended Pope ordered pictured painted of Muzio Attendolo upside-down and suspended from one foot. This type of art was called shame painting. The Pope displayed these paintings all over Rome. In both cases, the men hanging upside down were traitors. And that’s the meaning used in Tarot: The Magician. The brother to Luke Rykell is Gabriel and he was tasked with illustrating the cursed deck of cards. Only when he reached the final illustration, he balked—not ready to doom his soul to eternal torment. His betrayal led to the entrapment of Luke inside the Tarot cards themselves. What Does a Giant Snail Have to Do with All This? The fact that Luke lives in a tower attached to a snail is not a mistake. While researching the aspects of the magician card, I wanted to hone in on the idea of the will and the mind (both traits associated with the Magician card). 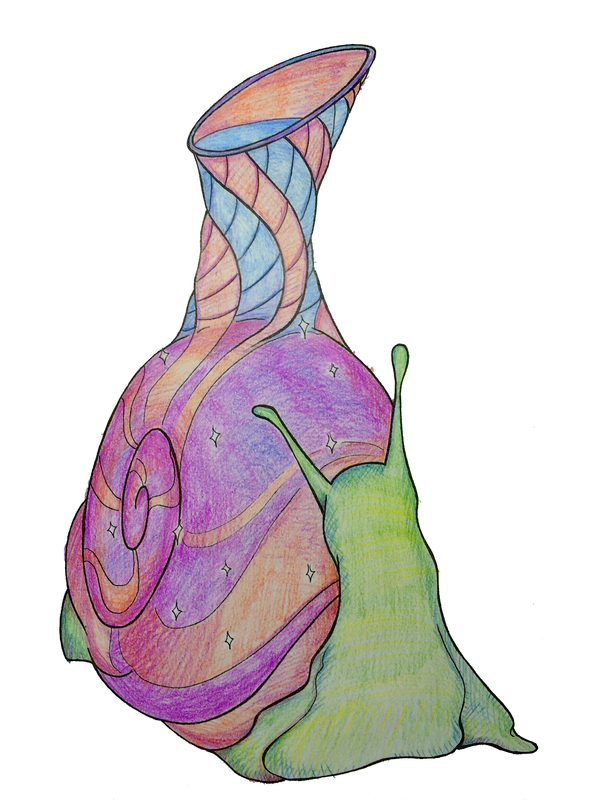 This led me to the spiral of the snail’s shell, and how it winds in on itself. 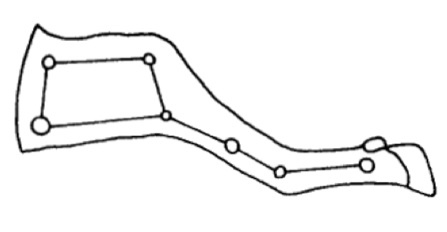 This is a common symbol for expanded consciousness. 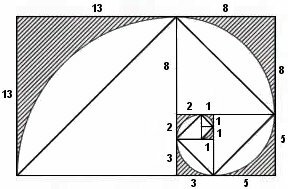 In sacred geometry, the spiral follows the Golden Ratio. So the home for Luke was both a way to expand his magical powers of intellect, but also a prison that spiraled in forever. It also wasn’t lost on me that in Christian symbolism, the snail stands for sloth. Although Luke is far from lazy, he does linger in his card for hundreds of years and this plays on his mind. There are many stories attached to the Tarot cards. The symbolism is rich and goes back centuries. The more you dig up on the Tarot, the more they will amaze you. I’ve never had this fear. But I do now. Except, this fear doesn’t factor in ceilings. Okay, this is one that I had all the time growing up. No, I still have this one. When it’s dark, everything starts to take shape. And it freaks me out. This one seriously freaks me out. 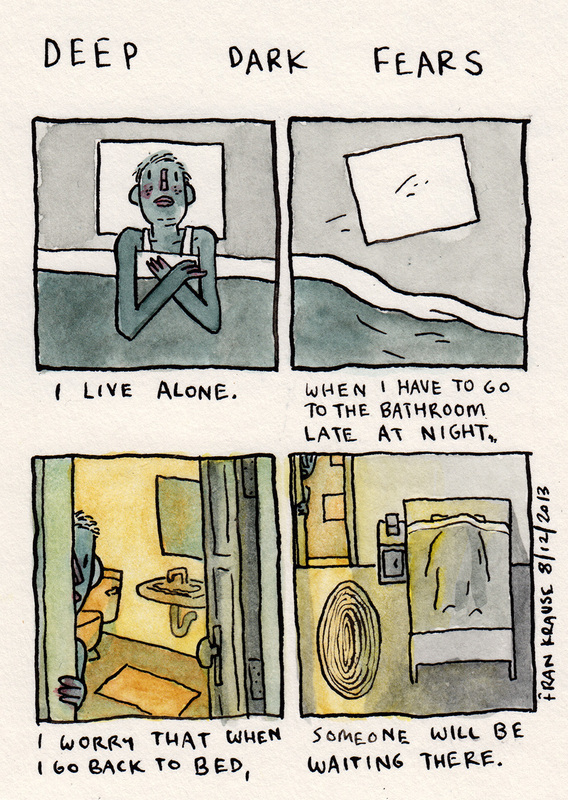 Mostly because I believe in ghosts, and I could see a ghost taking up space in my bed. 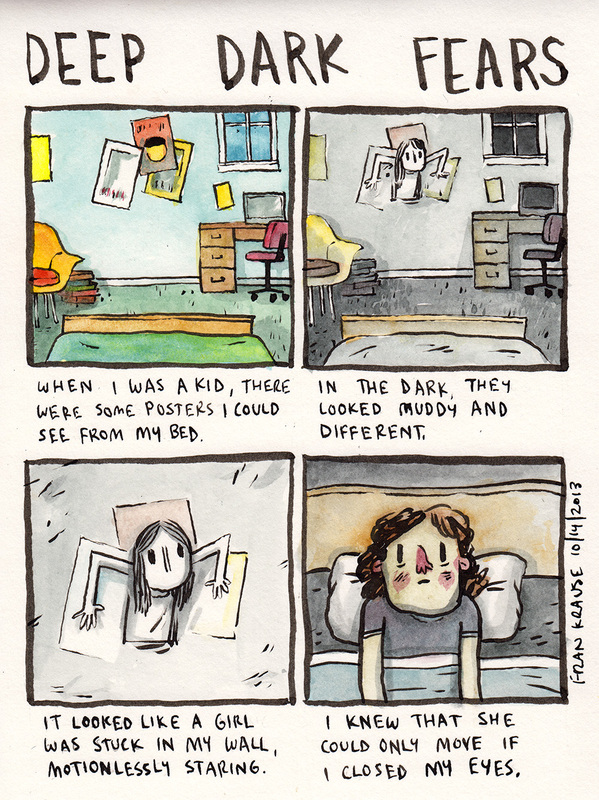 Check out more of these bizarre comics at Deep-Dark-Fears. There are actions on your body long after death. Many I wasn’t even aware of until after seeing “Danse Macabre”. When this first started, I thought… Uh Oh. This is going to be some artsy piece where someone “interprets” the movements of a corpse. No way. Nearly all the movements the actor/dancer portrays seem genuine and believable. I say nearly, because the rigor on the table leading to the fall is staged, but for a good reason. It leads to an incredible image of the person falling down the drain with her blood. Here are some stills from the film. I had never considered how a person’s feet would slide after being hanged. This is a detail that is typically lost when we think of a hanged person. 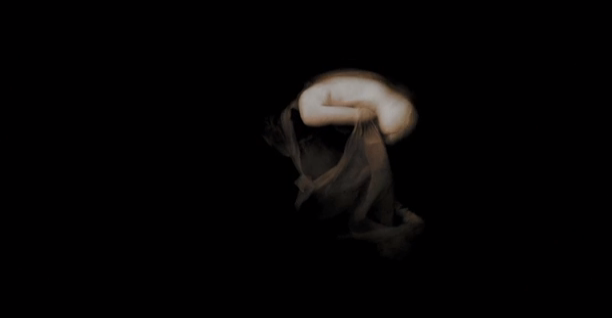 Many of the movements in this piece walk the line of morbid and beautiful. This, as I said, was the most staged position. The rigor led to the body falling off the table. Yet the scene that followed was astounding. We go from a view of the drain to a shot of the body, curled up, falling away. Stunning. I had never considered this rather pedestrian movement of the body. Quite literally, it is lowered into a casket. I’d never thought about how the body was placed in there. The most beautiful, and surprising movement, came from an interior shot of the casket. As it is being moved around, the body slides. I’d never even contemplated that. Here is the full video. It’s about 9 minutes. Do You Die A Little Bit Every Day? How risky is risky? When you have a brush with death, when does that brush turn into a downright shove? That’s the question that Ronald A. Howard attempted to answer with the “micromort” or tiny death. The micro-mort is a unit of death. Add enough micro-morts and, you guessed it, you’re dead. When Ronald A. Howard started as a professor at Stanford, he concentrated on breaking a fatal risk into small units. A micromort is a one-millionth chance of death. Different risk activities would have different levels of death, a higher or lower micromort total. This guy isn’t going midichlorian on us. He simply wants to guague the risk of death. Driving 250 miles in a car increases your death chances by one micromort (I’m not sure if this is continuous driving or over a period of days). Things fall into perspective when you find out that you can only travel 6 miles via motorcylce to get that one micromort increase. This makes it a much more dangerous trip. The micromort can be viewed as the average “ration” of lethal risk that people are exposed to daily. So don’t get all hung up on it. The life expectancy for an average human is one million half hours (source here). That means that micromorts turnout to me a measure of your life (because you will eventually die). That would mean you spend 1 micromort per half hour. Any activity that raises that (like general anaesthetic) creates more risk. When you step outside the films and popular fiction, vampirism gets a little wonky. 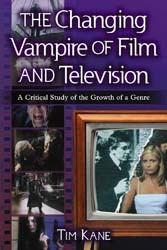 In Eastern Europe you don’t get bit to become a vampire. Often, you’re born a vampire. Say what? True, many people equate vampirism to a curse. And there are plenty of ways to get cursed. A child born with a caul (a piece of membrane that covers a newborn’s face) would become a vampire after dying. To prevent this, the caul needed to be removed, dried, and ground up. Then the child would eat the powdered caul on his or her seventh birthday. A very common cause of vampirism is to die without ever being baptized. 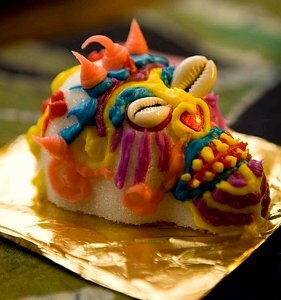 This leaves the person vulnerable to malicious spirits. Suicide is the number one cause of vampirism nearly everywhere (Europe, Africa, China). Similar to being unbaptized, suicide was considered a sin against God. The person was buried away from the village, not on hallowed ground. The English had an interesting tradition of interning the corpse at a crossroads with a steak through the heart. The stake prevented the body form being animated by evil spirits. In Germany, people who died from an accident risked becoming a vampire. Just a little to the south, in Bavaria, simply leading an immoral life could turn you into a vampire after death. Werewolves were closely related to vampires. Therefore, anyone who ate meat from an animal killed by a wolf would become a vampire. Finally, is anything disturbs your grave, you will rise as a vampire. If an animal runs across your grave, you’re a vampire. Strangely, if a nun crosses your grave, forget about it. Vampire. This begs the question, how many nuns are traipsing through the cemetery? Be careful folks. Multiple mistakes with your life (or death) can transform you in to the living dead. We all want vampires dead, but what to do when it’s the middle of night and there are no stakes nearby? Why, reach for a sock, of course. By far the most common method to off a vampire is with a stake. Van Helsing uses it, why shouldn’t you? However, you don’t always have to chop up grandma’s antique chair. A needle also works. Romanians believe (present tense, mind you) that a needle inserted into the navel will kill a vampire. Why the navel? That’s where the second heart lies. It has to have a second one, because the first one went kaput when the person died. The second heart is what keeps the vampire alive after death. 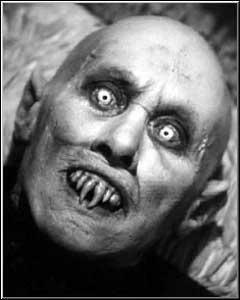 Vampire blood was so evil that any person who came in contact with it would become insane. Therefore during staking, an animal hide was placed over the body. Vampires were seen as squishy blood balloons, so this form of protection helped minimize splatter. Steven Weber (playing Jonathan Harker) could have used a bib in Mel Brooks’s “Dracula Dead and Loving It.” Click on the picture to bring up the YouTube clip. A consecrated bullet would kill a vampire, but not in the way you think. Shoot it through the coffin. One reason for this might be that it spoiled the coffin and gave the vampire no place to rest. A version of this can be seen in Coppola’s Bram Stoker’s Dracula where they ruin the vampire’s coffin but placing holy wafers in the dirt. The idea that sunlight can kill vampires is an invention of film. In Poland and Prussia, the creatures can hunt the living from noon till midnight. Even Bram Stoker’s Dracula could function in daylight. 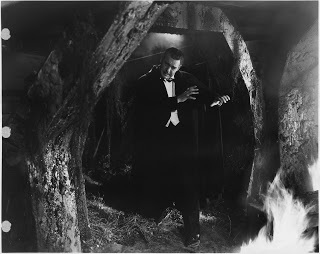 1943 Son of Dracula played by Lon Chaney Jr. just before sunlight strikes him. The first film to have a vampire to die by sunlight is Son of Dracula with Lon Chaney Jr. as the vampire. The rays of dawn strike his body and he fades from sight. A few months later, Return of the Vampire showed Bela Lugosi (playing a vampire called Armand Tesla) succumb to sunlight. Though this isn’t really fair, as he was simultaneously being staked by his werewolf servant. 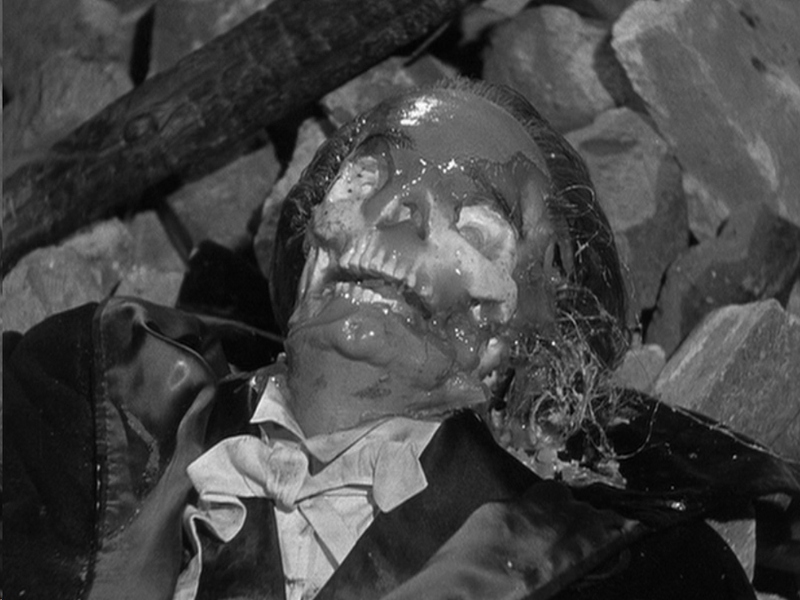 The film did depict the first image of a vampire melting in the sun. The first face melting of a vampire in sunlight (or from staking, who’s to say). If you suspected that your kin were a vampire the solution was simple. Dig up the body, dismember, burn to a crisp and drink the ashes. A pretty hefty cure if you ask me. Boiling oil was another method to destroy the undead. Vampires were considered terribly OCD (counting knots or grains of rice). The final method of demise plays off this weakness. Steal the vampire’s left sock (I’m assuming this is the evil one with the Latin name for left being sinister). Then fill it with rocks and toss it into a river or other running water. The creature will go after it (possibly crying, “Who took my sock.”) and the moving water will be its downfall. Moving water was long believe to destroy vampires. That’s it. Now you know all there is about how keep vampires out. If, however you’re yearning for a midnight nibbling, you know not to take the guy’s sock. He needs that.